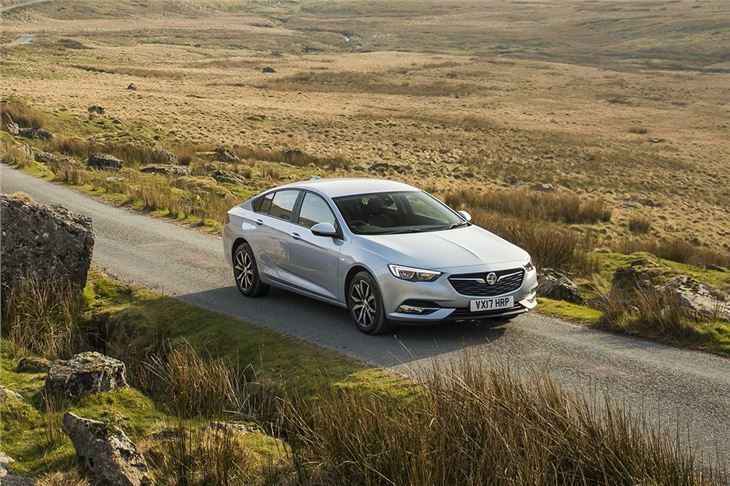 If you go outside, chances are you’ll see grass, clouds - and a Vauxhall Insignia. They’re everywhere. So the all-new one is a pretty big deal. And big is the operative word because this time around it’s longer, wider and more spacious. That could be why Vauxhall has decided to call it Insignia Grand Sport this time around. The larger exterior dimensions mean cabin space has been increased versus the outgoing car, with enough leg and head room for adults to sit comfortably in the back row. And yet, despite being bigger and more practical, it’s lighter and cheaper than its predecessor, without losing out on standard equipment. If you go for a basic Design model prices start at just £17,185 – and it’s not exactly stripped out and barebones. It comes with automatic lights, air conditioning, lane departure warning with lane assist, front collision alert, cruise control and an eight-inch touchscreen, complete with Android Auto, Apple Carplay, Bluetooth and DAB radio. Even going for a popular combination of engine and trim – like the 110PS TurboD SRi Nav tested here – doesn’t crank up the price all that much. Our test car costs £21,080 before options. You can thank company car rules for that – more than 80 per cent of Insignia Grand Sports will be sold to fleets and low prices mean lower Benefit in Kind tax. 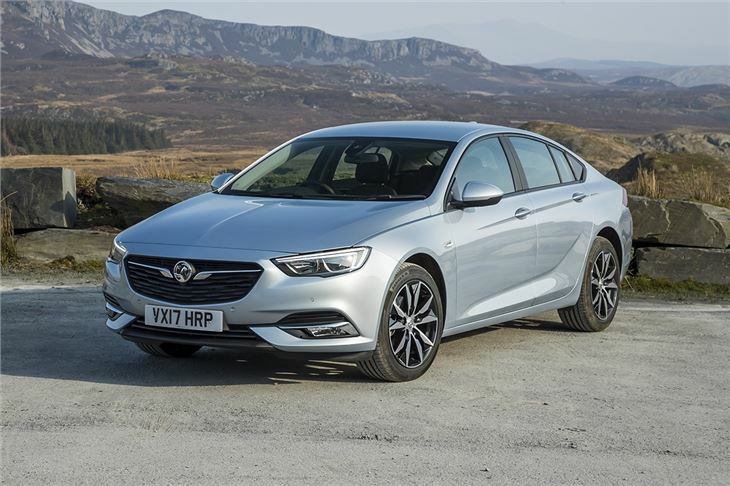 The 110PS diesel engine in our test car has the strongest fuel economy and lowest emissions of any Insignia variant, with 70.6mpg and 105g/km of CO2 according to official figures. It’s the least powerful engine in the line-up, but keep the revs up and it’s surprisingly punchy and capable, with maximum torque of 300Nm. For motorway cruising and A-roads it’s fine, with very little engine noise making its way into the cabin. If you drive on twisting roads a lot it isn’t the best choice, though – since the gearbox needs to be worked to keep the turbocharger on boost. Fortunately gear changes are light and slick. There's also a 136PS version of the same engine, plus a 1.5-litre petrol with 140PS or 160PS, a 2.0-litre petrol with 260PS and a 2.0-litre diesel with 170PS. The handling is neat and body roll is well controlled, plus the ride quality is good and the steering nicely weighted. The Insignia flows from corner to corner and does a good job of soaking up potholes and road imperfections, with only very the biggest lumps and bumps causing the suspension to thud. It’s comfortable too. The driver’s seat has lots of adjustment and is supportive, so long journeys shouldn’t mean back ache. The layout is more driver-focused than before and the controls are much easier to get to grips with – the button-heavy centre console from the previous car is gone, replaced by a clear and simple layout with intuitively placed switches. The design may be more straightforward than before, but unfortunately the cabin still doesn’t quite match rivals when it comes to material quality. There are plenty of soft-touch plastics, but the fake chrome dial surrounds and faux-carbon fibre inlays don’t look especially classy. A Skoda Superb is head and shoulders above the Insignia on this front. But there are no complaints when it comes to space. The back row is big enough to comfortably seat tall adults . And the boot, while slightly less spacious than in the outgoing Insignia, is still more than big enough for suitcases, flat packs and more or less anything else at 490 litres. It’s a hatchback design only this time, with no saloon available. Our SRi Nav test car has all the essentials as standard, including dual-zone climate control, keyless entry and start, navigation and a touchscreen. Some of the optional extras fitted to our specific car include £1010 LED matrix headlights that intelligently and effectively avoid blinding other drivers, plus a £290 head-up display and leather sport front seats at £1155. But even with all of its options, our test car came in at less than £26,000. That’s far from expensive for what is a large, practical, well-equipped and good-to-drive car. 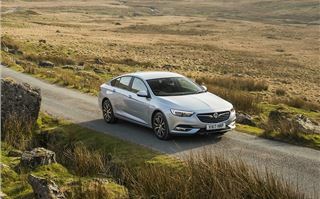 A Skoda Superb feels more upmarket and a Ford Mondeo is a little sharper to drive, but the new Insignia is a big step forward and a much smarter buy than its predecessor.